If you are looking for a security (Indoor & Outdoor) with the multi zones provided for both Audio / Video sources, and to improve your unique lifestyle, we are proud to introduce you the high quality McLelland AVD -800P. 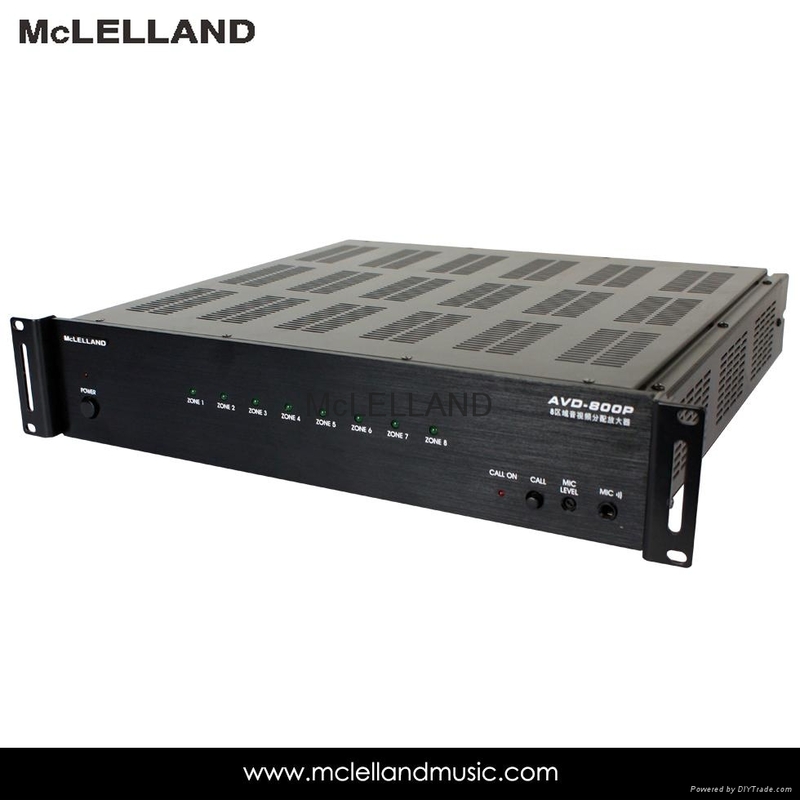 The McLelland AVD-800P is the most fantastic & powerful audio and video control center, the AVD-800P System consists of the AVD-800P Controller/Amplifier, you can easily program and control 2 audio,4 video (or audio) and 4 security camera module inputs to 8 different rooms (zones) in Compatible applications or any big facilities. It includes 8 individual control keypads, and 8 IR Emitters (additional keypads can be ordered as needed). When combined with almost any 8 IR controlled Audio / Video source components (CD, DVD, VCR, Tuner, Satellite 1, Satellite 2, etc.). The AVD-800P System controls, distributes and amplifies your favorite sound and frame to as many as 8 zones. With functional of AVD-800P and careful planning, can easily save money and time for both installer and homeowner. With multi Audio and Video source inputs, and mulit zone-specific outputs, any source can be selected and controlled from any zone. Additionally, multiple users can utilize multiple sources anywhere, throughout the home, at the same time. Phoenix Connectors: For audio signal outputs. 8 RJ45 Connectors: For keypads including video signal output. 6 Stereo Source Inputs: 2 audio 4 video (or audio) and 4 camera module inputs are acceptable. Maximum Expand System: 16 x AVD-800P. Independent IR Emitter output for each zone. Trigger On and External Mute jack on rear panel. DIP switch for AGC level and address select on rear panel. Power Supply: AC 115V 60 Hz / 230V 50 Hz, Can be switched. Dimension: D 413 x H 88 x W 427 mm. This design is powerful to combine and distribute audio/video security camera sources with this unique unit in your site-place. Re-In/Output 10 Audio/Video sources to other AVD-800P with IDC Flat Cable. L+R stereo RCA Jacks for connecting Zone Audio Output to an external amplifier. For use with applications where either more power is required for Zone or passing to a Dolby Pro compatible receiver for theater quality audio in zone. Use the included 4-conductor plug-in connector, (8 included) to connect speaker wires to the AVD-800P. Gold-plated RCA Jacks for composite video input from source components. For stereo line level audio input from source.